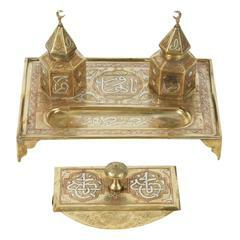 A beautiful red-cranberry Moser crystal and enameled box made for the Islamic/Moorish market. 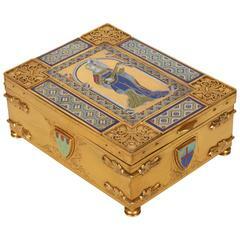 This box is made with beautifully handcut red-cranberry glass and overlayed with gorgeous platinum, 24-karat gold, white, yellow, green, orange, red, and blue raised enamel decoration. The enamel decoration includes flowers, vines, and Islamic shapes. The enamel work is further adorned with 24-karat gilt decoration and platinum, emphasizing the superb craftsmanship and artistic work. 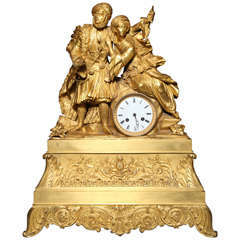 The box sits on four bronze doré lions paws, as well as includes two intricately designed bronze doré handles. Austria, circa 1890. 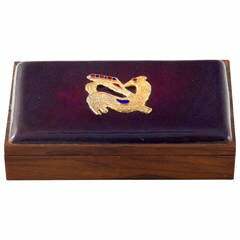 Gorgeous deep purple enameled Danish rosewood jewelry or desk box with gilt enameled detail. Wooden interior and bottom.